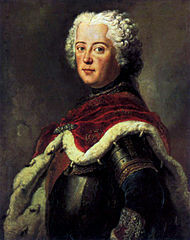 Frederick II of Prussia (Friedrich), King of Prussia (1740–86). Was nicknamed Der Alte Fritz (“Old Fritz”). – Frederick the Great, 1757. When the guards hesitated at the battle of Kolin. but I have tried to verify as many of the quotes by Frederick the Great as possible. Please contact me if you find any errors in the Fredrick the Great quotes, have some additional information about them or if you know any quotations from Frederick the Great that are not listed here.